in Search Marketing with tags bing, Facebook, google+, Microsoft, twitter Both comments and trackbacks are closed. Social signals such as likes, shares, tweets and +1 are playing an increasing role in search engine ranking algorithms. As part of its ongoing social integration efforts (and exclusive partnership with Twitter), Bing recently launched some new features to bring even more Twitter data into the SERPs. Marketers may recall similar efforts from Google in which the engine for a time incorporated tweets into its results – a feature that faded by 2011. As social integration becomes more prevalent in search engine marketing, Bing’s move causes one to wonder: was Google’s feature simply ahead of its time? 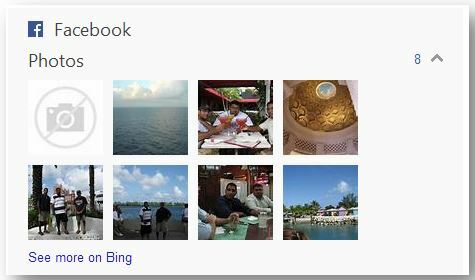 In recent weeks, there appears to have been a decline in Facebook personalization in Bing’s search results: where once one searched for topical terms like destination vacation spots and was presented with friends’ Facebook photo albums in the right rail (see first image below), they are now being presented with content from Twitter (see second image below). It would appear that, at the very least, Bing is testing a strategy that involves increasing the prominence of its Twitter partnership at the expense of Facebook social signals. The first new feature is the ability to search by hashtag. 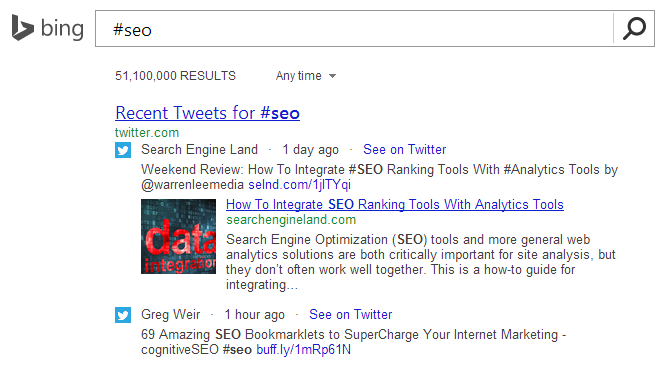 Once a searcher begins typing with a hashtag, Bing will suggest potential popular topics relevant to the query. Upon submitting the search, the user will see what Bing has determined is the most recent relevant content. The second feature allows users to search for specific Twitter handles, such as Google’s head of Webspam, @mattcutts, featured below. At the time of this post, it appears that only verified accounts are findable this way within Bing. Organic search remains the leading vehicle of discovery for brands. While the long-term vision of Bing’s Twitter integration is unclear, these new features should prompt brands to ensure they have verified their Twitter handles to increase their exposure to the searching public on Bing. Going back to 2011, Google’s Panda updates began downgrading low-value content, increasing the importance of both the quality and number of links as endorsements for the value of a piece of content. In 2012, Google’s Penguin update hit, reducing the impact that link schemes could have on a piece of content’s ability to rank. After Penguin, publishing quality content that earned quality links and that was socially endorsed became the standard to which all brands aspired. Bing’s experiments with social integration, both for Facebook and Twitter, are one of the strongest indicators yet to content marketers everywhere that shareability is no longer just a widget but a requirement for generating quality traffic.